God turned up wonderfully in the church Filadelfia, Sunday morning. The deaf received their hearing, the blond received their sight, the lame walked…and much more! 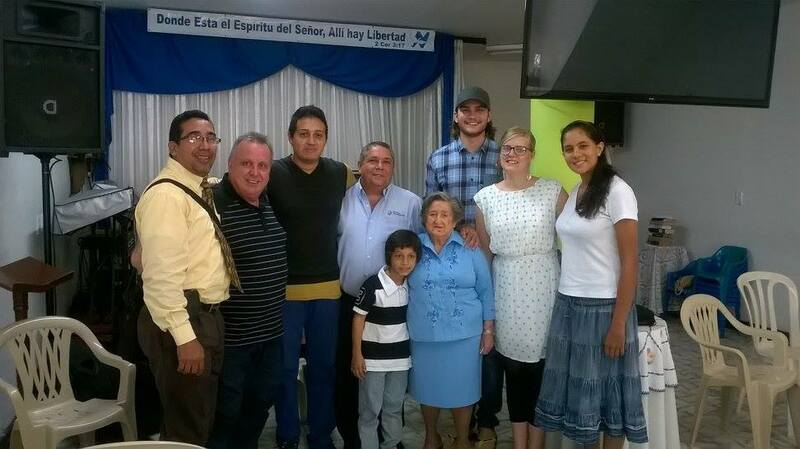 As I mentioned in the previous blog, it’s a church pastored by an incredible lady, Pastora Fanny, 88 years old, so short she came up to Andreas’s waist(! ), but a woman burning with Holy Spirit passion, fire, energy, and her church reflect just who she is. She’s an apostle to a good number of other churches in the city and the state of Cauca, an incredible testimony to anyone who thinks 65 is a ‘good age’ to retire. Fanny will never retire, of that I’m sure: it’s been a privilege to know her for a number of years now. The worship was passionate, Fanny fired everyone up with just a few short words, Andreas and Kristin both shared testimony – very, very well, too: their words added to the fire, an so it was easy to get up and speak after that. It’s great when you know that you’ve heard something from God: in the morning, about 7am, I’d got my sermon ‘sorted’ in my head. We were picked up for church at 9am by lovely Pastor William Castano – but for me, that meant William would be at the meeting….as he’s perhaps the nations’ most respected Bible teacher, it’s a wee bit daunting to preach with him there! As we were about to leave for church, God changed my sermon, with no time left to prepare (maybe that’s better in my case!!) – even more daunting! – on 2 Corinthians 3:18. Above the church’s platform was the church’s ‘motto’ text’ – 2 Corinthians 3:17! Then, I felt I could just go ‘on a roll’… thank you, Lord! Loads of people – probably most of the congregation, came forward for prayer for healing, and there were many healings – miracles, too, if you call neck to ankles chronic osteoarthritis being healed instantly, a miracle! I know I do…. It included the lady’s knees, par for the course when I pray for people these days, and she was walking, bending, squatting – with no pain at all. Many chronic pain infirmities went: gastritis: a man with no more than 50% hearing in both ears and 50% sight, received total healing for both instantly. A lovely little boy, Juan, seven years old, had a chronic, very rare eye disease, and his vision was no more than 20%, and one of his eyes constantly moved of its own volition – not ‘lazy eye’, something significantly worse. He could read, but only with a paper/book no more than 6 inches/15 cms from his face. In moments, he was reading the text over the platform: reading posters on the walls, all from distance, totally recovered and restored. Everyone with something ‘tangible’ – they could feel the change – wrong with them, was healed. Even a man with – I’d guess by his attire a street guy, who’d only been saved a few days – with acute bi-polar, felt the ‘switch’ in his head and left, looking and feeling very, very different. It was the same story for Andreas and Kristin: many physical healings, and emotional stuff that people knew had ‘changed’… I’m trying to persuade them to write their own reports for the blog here, but I need to keep working on that ;)!! They were both brilliant, into praying ‘command’ prayers from the start: with translators they didn’t know – no, Andreas had long-time friend, Johan – but their praying was wonderfully effective right from the ‘off’. Yesterday – Monday – was a national holiday here – so we spent time with people, so Andreas and Kristin could get to know them, and also, as is always the case with all of the teams who come here, recover from the ‘exhaustion’ of praying for people for some hours. And I’m sure this NEVER happens to any of you….! – mostly I’m pretty good with names, but there are just SOME people, however well I know them, however many times I see them, their names are magically erased from my hard-drive…. On the left of the picture of pastors/leaders, is Hugo: I’ve known Hugo at least 15 years…. It’s NOT a hard name, an easy one to remember, when I’m not with him, I can picture him, and know his name without any hesitation. When I’m with him – like Sunday, when he helped me with translation for praying for people – his name is gone L – bless him, I love the man, and once again I had to ask him to remind me of his name…. Is it an ‘ageist’ thing…?!? !